I’m sure you guys had a great time..
Posted on June 22, 2011 by Jian Akiraceo. This entry was posted in Festive Season and tagged Father's day. Bookmark the permalink. ==” your family is full of different member…last one is hamster too??? 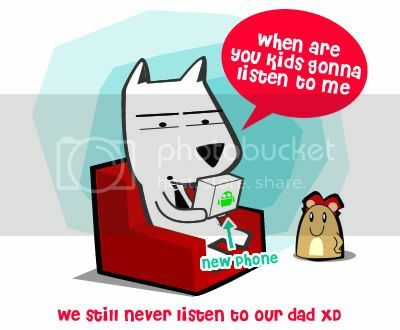 What phone you got your dad? So if your dad want a new phone, you won’t get him one?? the digiwwwow voting ended already. the time gap is only to prepare for the ceremony and other minor things. but ultimately, no voting anymore. awwww! miao this is so unique. who would have though you have such awesome siblings. i love ur siblings. haha, bring them more in the comic sometimes. love to know more bout you guys. .why are you locked outside your room with only a towel?? ?